This second edition of the highly praised and widely adopted text continues to guide students in examining their own social identities and how they interact with others using the lens of critical race theory. 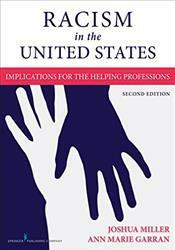 It is written for students entering the helping professions who must incorporate an understanding of racism into their relationally based work with clients and patients, organizations and communities. The second edition encompasses the many changes in socio-political context and conceptual thinking about race and racism that have taken place since the first edition was published. It features a reconceptualization of racial identity formation, and updates information on the intersectionality of racism to incorporate other identities and social oppressions. Also included are new case examples and additional experiential exercises to reinforce learning. Integrating theory, research, and practice, the text analyzes all levels of racism, from personal to institutional, and presents concrete facts about how racism affects people's lives, and the ways that systemic racism undergirds and reinforces both interpersonal and structural racism. It speaks to students of all races and ethnicities, and comprehensively tackles a challenging topic in an accessible and sensitive manner. Its approachable presentation fosters self-reflection and helps instructors to ease students into a difficult topic. The book fulfills NASW and CSWE requirements for cultural competence.